This past weekend was, yet again, a con weekend! This time it was Geek Girl Con, a feminist-focused convention where inclusivity is the name of the game and literally everybody is excited about social justice. It’s my favorite con, as well as the first con I ever attended; I’ve been every year since its inception, and I intend to continue attending every year that I possibly can. Discussing and accepting queer sexualities is par for the course in a place like GGC, but bisexuals still run up against opposition from the queer community with alarming frequency. There’s a common misconception that bisexuality is just indecisiveness, and thus bisexuals often feel excluded even from queer spaces, so it was nice to see one of the larger geek brands like optimysticals reaffirming the validity of bisexuality (and its popular fandom ties to Captain America, no less) with this charming bracelet. The vendor told me that earlier in the con, a girl had seen the bracelet and started crying on the spot because she was so relieved to have her sexuality validated, even in such a small way. Well done, optimystical. The last panel of the con that I attended was Gaylaxy Quest: Queer Scifi & Fantasy. It was a fantastic panel, from which I got a lot of excellent recommendations for queer-representative speculative fiction to seek out, but the panel was made up entirely of white women. Refreshingly, though, they were quick to point this out about themselves, and openly express hopes that next year a similar panel would include more diversity. When was the last time you heard a panel call themselves out for being unrepresentative? I’m sad to be only discovering these guys at the end of their summer season, but ecstatic to have discovered them at all. 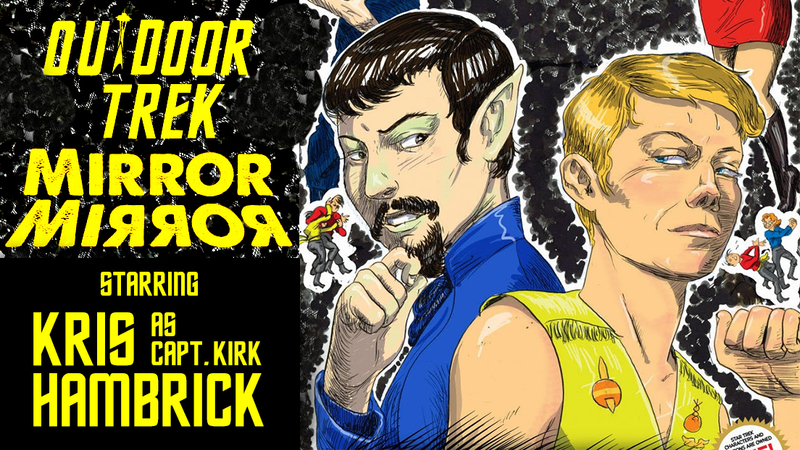 Outdoor Trek is a drama troupe that puts on live-action recreations of episodes of original Star Trek, in this case Mirror Mirror. This was a thoroughly enjoyable production, complete with fantastic live band and scifi sound-effects, but perhaps my favorite part was how they didn’t feel the need to match character genders. Both Spock and Kirk were played by women, who both knocked it out of the park, and the man playing Kirk’s one-off love interest was absolutely brilliant. It’s nice to see a production company more interested in matching actor abilities than actors’ bodies. One of the best things about GGC is how its small size and inclusive atmosphere makes it easy to strike up conversations with strangers, most of whom will turn out to have awesome ongoing projects. This year, I met Crazy Aunt Lindsey, who makes a youtube series called “the Fab Lab” featuring educational DIY science projects for kids. She describes it as “Bill Nye meets Martha Stewart,” and she’s produced some awesome content. Check out her youtube channel here, and her indiegogo campaign here. Like most cons, GGC features a lot of fantastic cosplay. Unfortunately, awesome cosplay sometimes means cosplay mishaps, which is what happened to a friend of mine, who lost a button off her perfectly tailored Peggy Carter jacket sometime early Saturday. She was lamenting the loss of this button with great aplomb, and so the idea of it stuck in the rest of our heads well into Sunday, when I accidentally kicked something while leaving the con center for lunch. Anne picked it up, and Kenna recognized it: it was the missing button. What are the chances of that? It’s a small miracle–one of many at a place like GGC. Until next year, GGC. I’ll be seeing you.